Russian military target satellite. Cosmos 1786. Calibration mission. 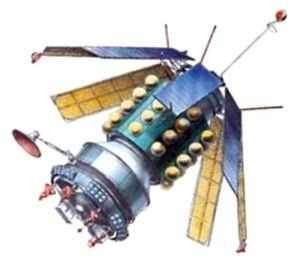 Tentatively identified as third generation replacement for Taifun-2, perhaps to have been launched by the Tsyklon 3 launch vehicle. Radar calibration satellite built by Yuzhnoye, Russia. Launched 1988 - 1990. AKA: 17F115. Status: Operational 1986. First Launch: 1986-10-22. Last Launch: 1986-10-22. Number: 1 . Gross mass: 15,000 kg (33,000 lb). One possible launch in 1988 by Zenit-2. Family: Military, Military target sat, Surveillance, Surveillance orbit. Country: Russia. Launch Vehicles: Zenit-2. Launch Sites: Baikonur, Baikonur LC45/1. Agency: MO, Reshetnev bureau. Bibliography: 102, 2, 279, 445, 6, 12735. Cosmos 1786 - . Mass: 15,000 kg (33,000 lb). Nation: Russia. Agency: MO. Class: Surveillance. Type: Radar calibration target. Spacecraft: Koltso. Decay Date: 1988-03-06 . USAF Sat Cat: 17042 . COSPAR: 1986-080A. Apogee: 1,054 km (654 mi). Perigee: 149 km (92 mi). Inclination: 64.80 deg. Period: 96.70 min. Radar calibration mission..